Taco Tuesday: it’s a real thing. It’s probably also responsible for the 15 pounds I gained my freshman year of college (well, at least in part…). 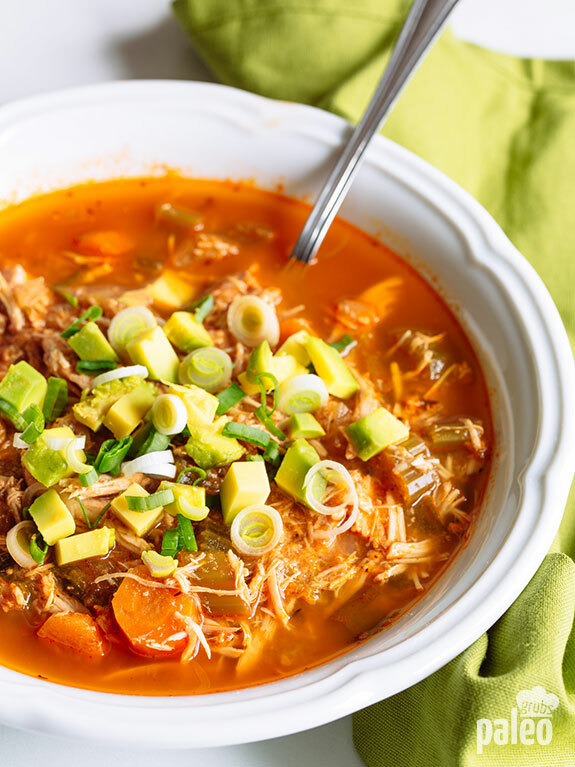 With this recipe you can get all the great flavors of taco Tuesday with a slow cooker taco soup any day of the week and enjoy a healthy, hearty Paleo meal at the same time. The great thing about this recipe – well, one of the great things – is that you don’t have to spend all day over a hot stove to get amazing flavor at dinner time. 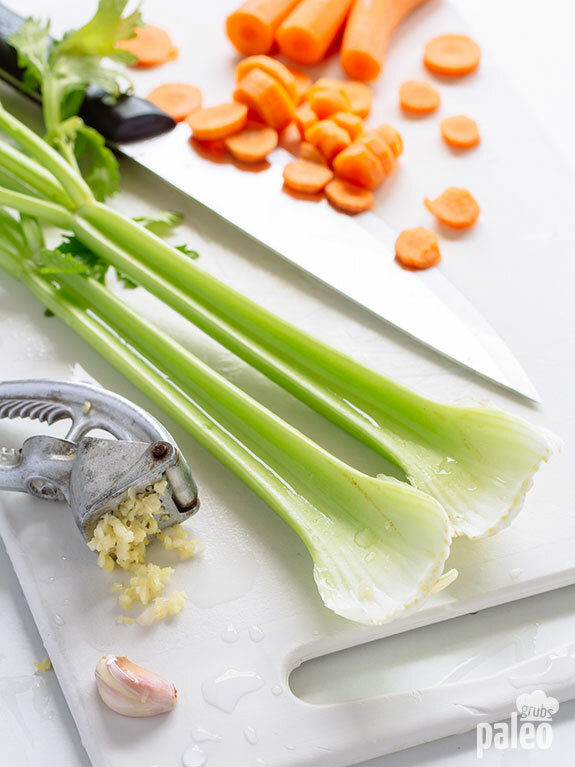 Prep all your veggies, toss the ingredients in your slow cooker, and let the machine do the work all day long while you get on with your life. 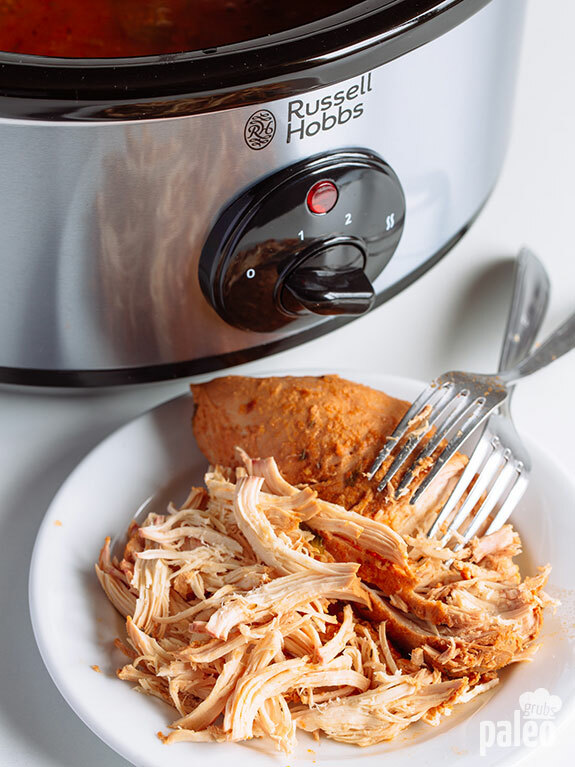 By the time you’re ready to shred the chicken, your home will be filled with the tantalizing aromas of taco soup. 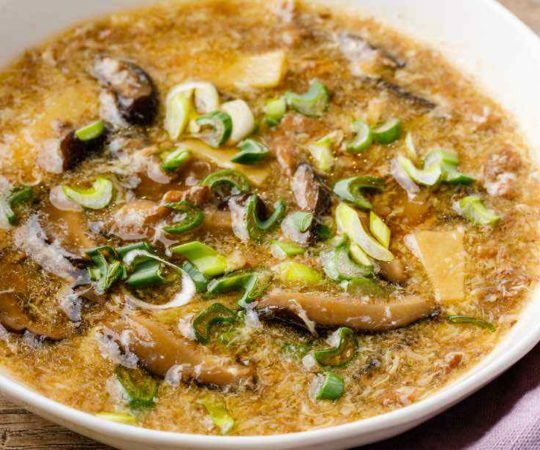 You’ll notice that the first couple of ingredients make this recipe sound a lot like chicken soup and that’s right! You could probably stop halfway through and have a tasty chicken soup on your hands. But why stop there when you can blast the flavor profile on high? 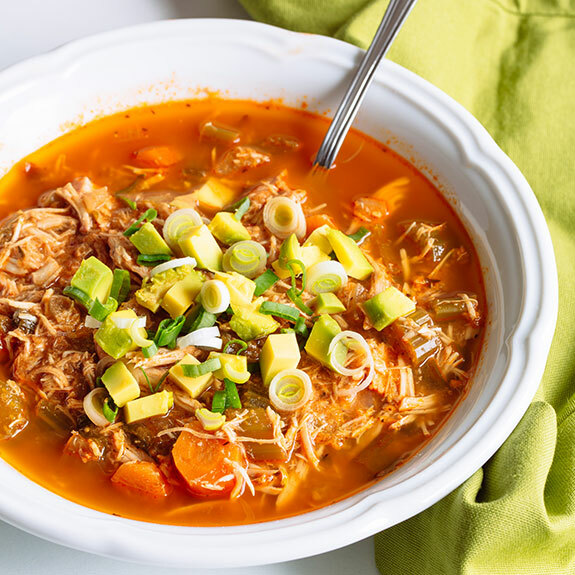 To turn chicken soup into taco soup, this recipe relies on a bunch of traditional taco flavors: tomato (from the tomato sauce), cayenne pepper and sweet paprika (so you get smoky, sweet, spicy flavors! ), thyme, and oregano. You might be wondering about the red wine vinegar. Without it, the soup might end of tasting like spicy chicken soup (not a horrible thing, admittedly). But with it, you get a bit of the tanginess that most hot sauces and taco flavors feature. It’s what you might call the secret ingredient…not so secret anymore! I encourage you to use homemade chicken stock or hot water with homemade instant bouillon cubes because store bought chicken stock and bouillon cubes are often full of preservatives and have a lot more salt and monosodium glutamate than you want or need. Every few weeks I take the time to make homemade chicken stock and then I portion it into two or three cup containers and freeze it so I always have chicken stock when I need it. This slow cooker taco soup is good not only any day of the week, it’s good for just about any event. 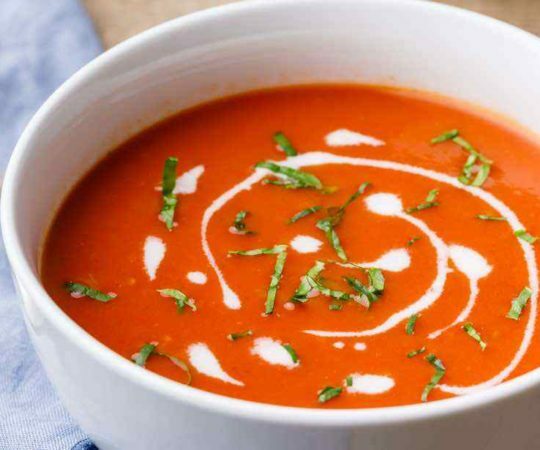 I often make this soup on the weekend and bring leftovers to work for lunch. Other days I start it cooking in the morning and chow down in the evening. But it also makes a great meal when you’re having company over, as long as you can plan ahead by about a day. 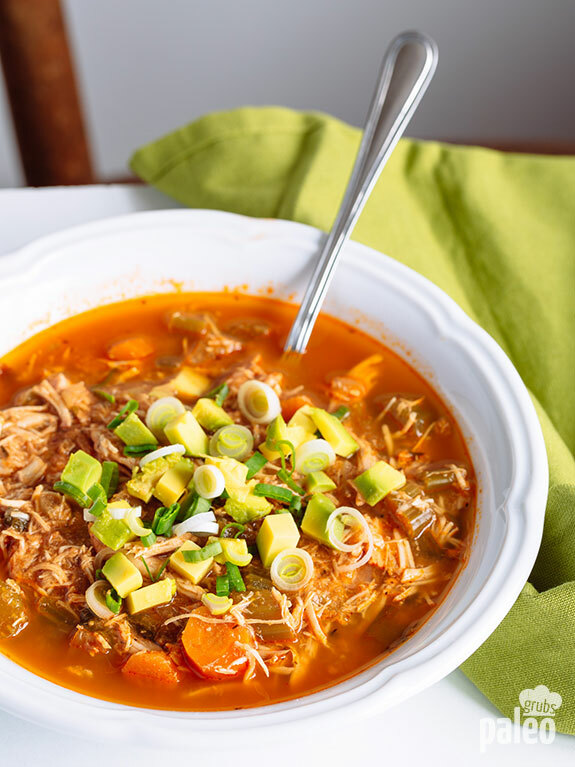 Everyone loves the rich, spicy broth (you can control the spice level by how much of the cayenne and paprika you add), filled with the tender, flavorful, shredded chicken. As a Paleo dish, it’s an A+. 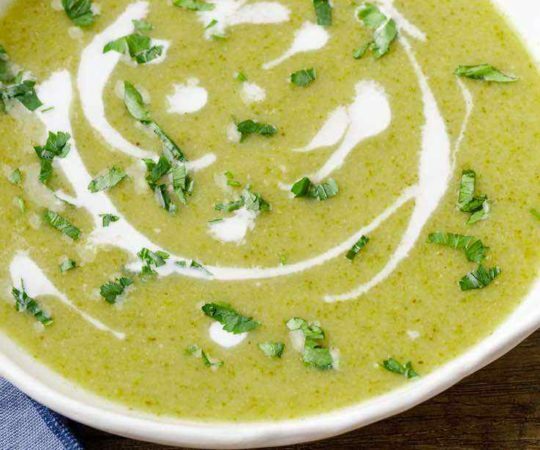 It’s chock full of protein from the chicken and the slow cooking keeps all the vitamins and nutrients of the veggies in the soup. That makes this a healthy Paleo dish that packs a flavorful punch. So next Tuesday, skip the tacos and instead make yourself a big bowl of slow cooker taco soup. 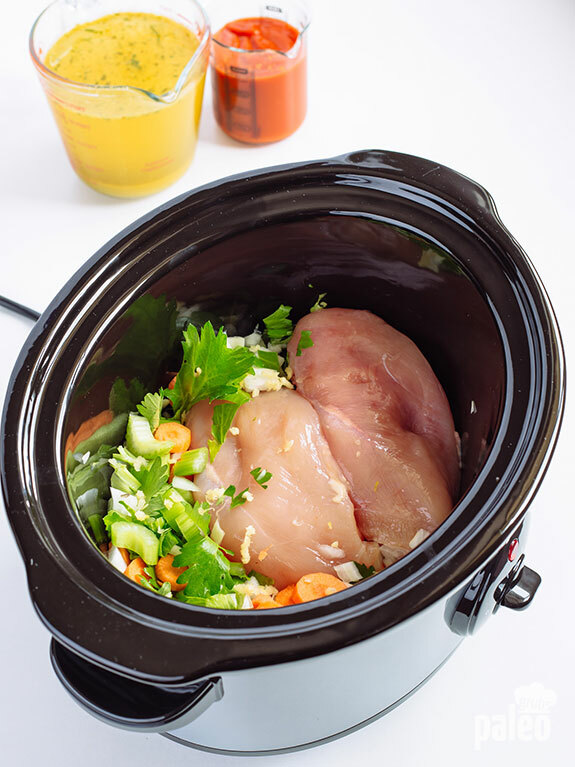 In a crock pot place the chicken breasts, chopped veggies, stock, tomato sauce, vinegar, spices, pinch of salt and pinch of pepper. Stir, cover with a lid and cook for 8 hours on low. Remove the chicken breasts from the pot. Use two forks to shred the meat. 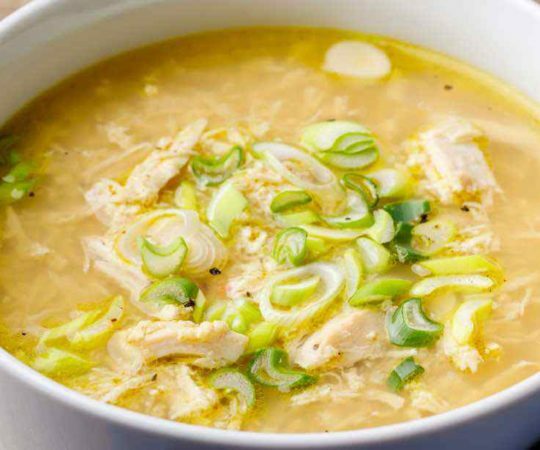 Return shredded chicken into the soup and mix to combine. Season to taste with salt and pepper and serve topped with chopped avocado and spring onion. Hi y’all!! Thanks, for being there for me!!! Being 78 years old come (6/3), is not easy!!! Everyone wants to tell you, what “you need to do”!!! 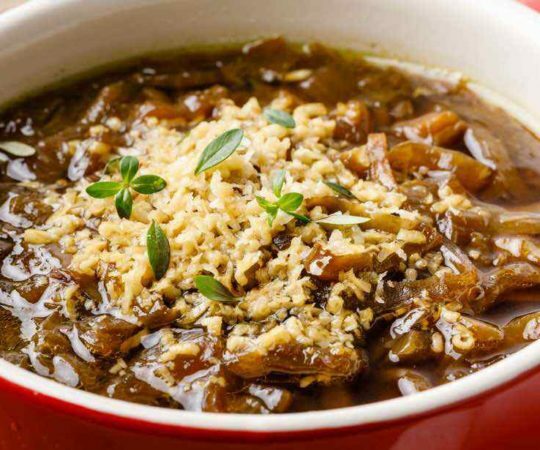 As far as MY diet, and Paleo Grubs, I really just NEED to do Your CROCK POT recipes!!! Thanks again!! Oh my! This sounds delicious. I’m making it tomorrow. I can’t wait to try more of your recipes. Thanks! Thank you. 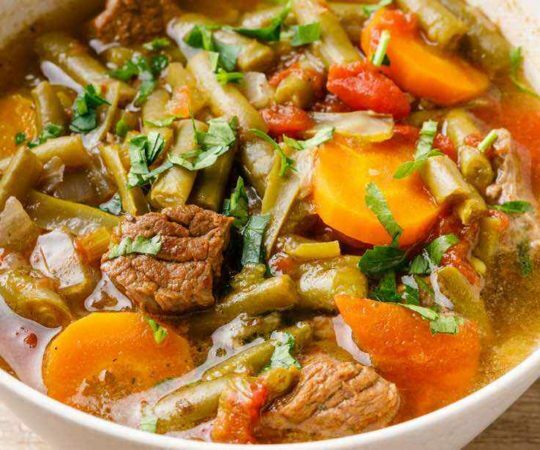 Good recipes like this make being paleo easier and enjoyable.